Item #DB-2273: 19 1/2" long Chrysoberyl Cat's Eye Bead Necklace with 3mm - 5.5mm pillow shape beads of 108.34 cts. TW & 14Kt. Yellow Gold Slide clasp with double safety and twelve round Diamonds of .08 cts. TW pavé set in White Gold. 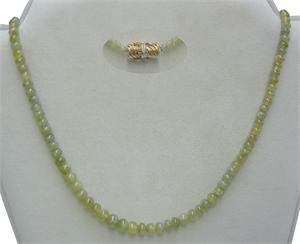 Item #DB-2274: 18 1/2" long Chrysoberyl Cat's Eye Bead Necklace with 3mm - 5.5mm beads of 89.52 cts. TW & 14Kt. Yellow Gold Slide clasp with double safety and ten round Diamonds of .05 cts. TW pavé set in White Gold. Item #RON-354: 14Kt. Yellow and White Gold Pendant with a bezel set 10x11.4mm oval Green Cat's Eye Tourmaline Cab of 4.53 cts.